German potato pancakes aka kartoffelpuffer unlike the English version, which are traditionally made from mashed potatoes and then baked, are made from grated potatoes and often onions and then shallow fried. In Northern and Western Germany the potato pancake is like the wheat flour crêpe in Britanny and Basse-Normandie, the ultimate in street food and is sold in markets, fairs and holiday destinations for immediate consumption. However, unlike the crêpe, which is purely for sweet toppings, with its counterpart the buckwheat galette used for the savoury, kartoffelpuffer are used for both. The popular and traditional German dessert version would be served with apple sauce, cinnamon and sugar. As a base for a gluten-free dish therefore kartoffelpuffer are extremely versatile. The figs are from our garden. The Parma I buy as the end of the ham - the bit that no one can cut into a decent slice, so I get it at a knock down price! Bacon or ham of any sort would be just as good when matched with a fig and the vinaigrette below. Green salad leaves, here I'm using young beetroot leaves from the garden. The salad is dressed with a honey vinaigrette made with raw apple cider vinegar and olive oil and with just a hint of whole-grain mustard. 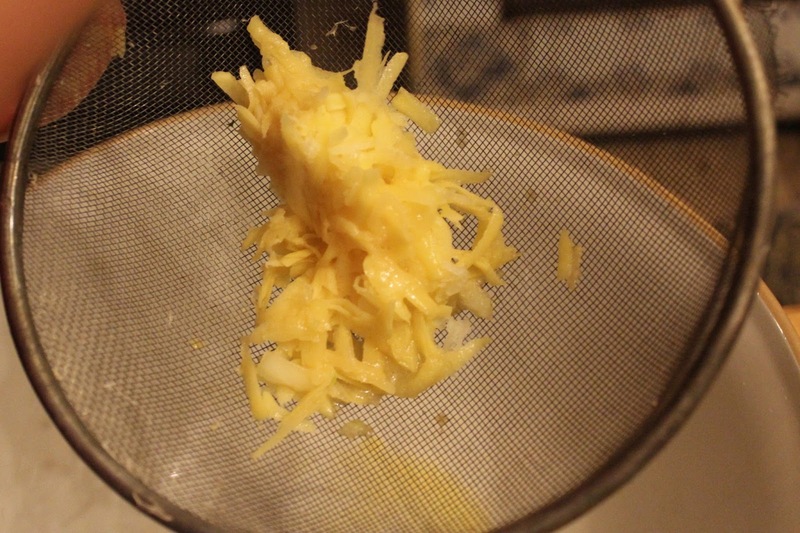 Using a large sieve held at an angle, over a bowl, squeeze handfuls of the grated vegetables to express the juice. The angle allows you to keep the potato mix draining, whilst squeezing further handfuls. Many people use a glass cloth or tea towel to do this but personally I find it makes for less clearing up to do it this way! Once you have finished, allow the liquid in the bowl to stand until you see the thick creamy starch separating from it and sinking to the bottom of the bowl. Pour the clear liquid from the starch. Discard the liquid and add the grated vegetables to the starch in the bowl. Season with salt and pepper and incorporate the egg and grated vegetable. Meanwhile heat a large frying pan with butter or an oil suitable for frying, just a thin layer. When the oil is hot enough so it sizzles when you add a test piece of potato, spoon in a tablespoon of the mix and flatten down with the back of the spoon. I like the pancakes very thin, that way they become very crisp and complement the salad really well. After approximately 4 minutes of cooking, when they are golden brown, flip the pancakes over to cook on the other side. Top pancakes with salad leaves, fig and ham and vinaigrette. They are usually served straight from the pan but actually we like them cold too!